They’re not passing it on, they’re not voting for anyone, they’re wasting their PR like so much pregnant chad!!! How can a chad get pregnant? And how does it relate to the context in my case? And I have tried to find its image. A 'pregnant chad' is so called because it is still attached at all four corners but puffs out like a pregnant woman's belly. 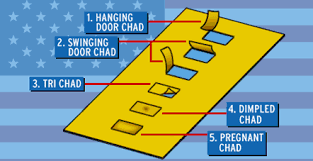 'Hanging chad', 'dimpled chad', 'pregnant chad' and the others entered US popular discourse in the controversy over the 2000 presidential election, when the decisive and very close vote in Florida was determined in part by the decision that votes with incompletely detached chads were invalid and should not be counted. PageRank is a “vote”, by all the other pages on the Web, about how important a page is. A link to a page counts as a vote of support. A 'wasted vote' is metaphorically equivalent to a 'pregnant chad'. What is the meaning of “the principle of the thing”? What is the meaning of “from the ground up” really? What is the meaning of “daisy pom”? what is the meaning of “squat spitting”?